We’re having a fun Saturday. Davey began his day with the monthly Home Depot craft. He and David built a miniature goalpost and painted it. We were all covered with paint when he was done. No, not all of us. David avoids it much better than I do. Then we accompanied David while he went to get a haircut. David had to wait for awhile so Davey and I walked to Dollar Tree. We hadn’t been there in forever. They have smaller carts there, so Davey really enjoyed pushing our cart around. But then we hit the Dollar Tree Jackpot. 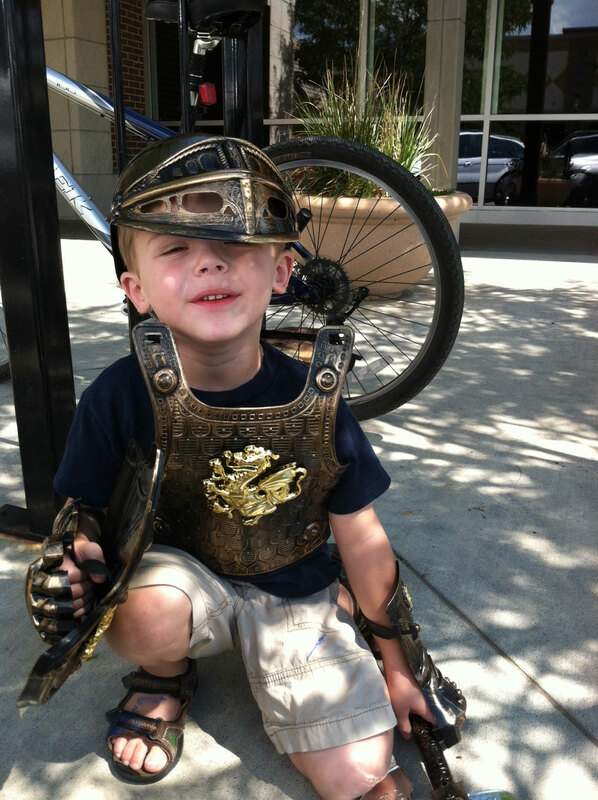 Armor! Davey was so excited. It’s still sweet Davey underneath! 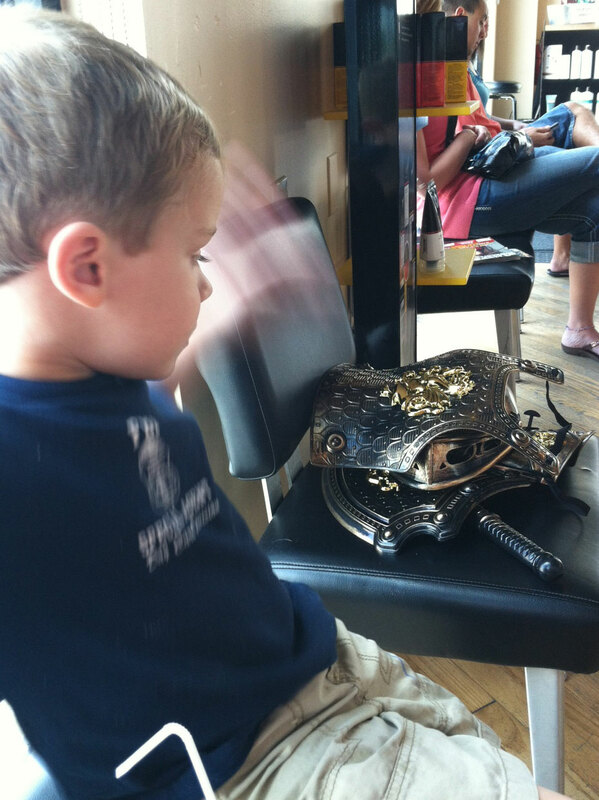 When we had to wait for David for just a bit at the barber shop, Davey carefully removed his armor and put it in the chair beside him. He says he wants this to be his Halloween costume. 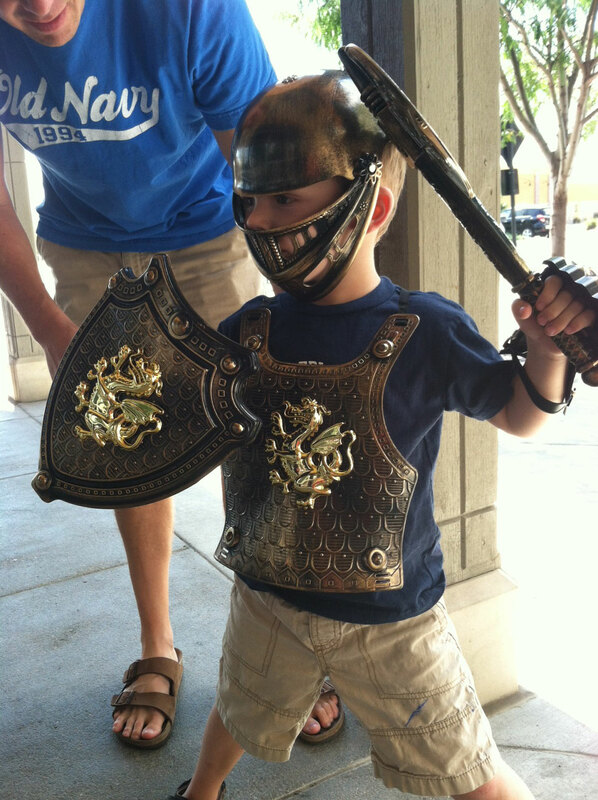 We need to fashion him a Roman skirt thing David says (I have no idea what this is called). We’ll see though. He may have other ideas as we approach Halloween. We are moving full tilt into Fall/Christmas Celebration Discussions! (Halloween, David’s birthday, his birthday, Thanksgiving, my birthday and Christmas). He was also very curious about this whole Labor Day thing. He wants to know how we should celebrate it, why we celebrate it, etc. He loves the idea of adding another celebration to the schedule!